House Science Committee tweets link to climate denial article at Breitbart. Smoke, or just hot air? Photo illustration by Phil Plait. Photo by Shutterstock/Mikhail Kolesnikov. The House Committee on Science, Space, and Technology is, ironically but shocking to no one who understands the majority party, quite anti-science. For years now, the committee and its chairman, Lamar Smith, R-Texas, have been merciless in their attacks on both climate scientists and the National Oceanic and Atmospheric Administration. Smith—who receives a large amount of funding from fossil fuel interests—has been subpoenaing NOAA staff and data repeatedly in what is a transparent attempt both to create a chilling effect and to directly prevent them from doing their very important research into human-generated global warming. The committee’s Twitter account often reflects this ideology. And Thursday afternoon, to the dismay of many, they tweeted a climate-denying “news” story from Breitbart. The content of this tweet is the same sort of thing you’d get if you fed a bull 20 kilos of Ex-Lax and stood behind it for a while. Global warming, of course, is real. The Breitbart article in question is written by James Delingpole, a flat-out climate change denier who has a history of writing grossly misleading articles about global warming. He gets this information from yet another climate change denier, David Rose, who wrote an article for the execrable Daily Mail claiming that global temperatures have dropped by an entire degree Celsius since this summer. Contrary to what the Daily Mail might have to say, global temperature is indeed increasing. In a nutshell, Rose is guilty of extreme cherry-picking. He looked at a single temperature data set from a specific layer of the Earth’s atmosphere and only used measurements over land. And to make matters worse, he only used data going back to 1998, a big no-no: That year was unusually warm, so starting there falsely makes it look like temperatures haven’t risen much. He also is chasing local fluctuations and ignoring the decadeslong trend. And that trend is up. The Earth is heating up. If you want more details, Tamino at Open Mind debunks Rose’s claims quite thoroughly. As wrongheaded as it is, this kind of climate denialism is de rigeur for people whose stance is so anti-science. I’m used to it, awful as it is. But it’s the fact that the house committee linked to Breitbart that’s so disturbing. And then, after finding all this out, I found (via Karen James) that Committee Chairman Smith actually has written for Breitbart! As physicist Robert McNees points out, this has been going on for some time now. And mind you, all this was before Trump was voted into office. These tweets, and the information they cite, are a scary reminder that climate deniers will feel emboldened by Trump’s election. Trump’s team is already planning to cut global warming research at NASA. As winter approaches, we’ll likely see more reality-challenged senators bring in snowballs to the floors of Congress and say, “What global warming?” every time a cold snap arrives, even though a lot of the brutal “polar vortex” conditions are actually tied to the effects global warming. Good on him! We need more people like him in Congress willing to speak up against this sort of denialism. The stakes here are as high as they can get. 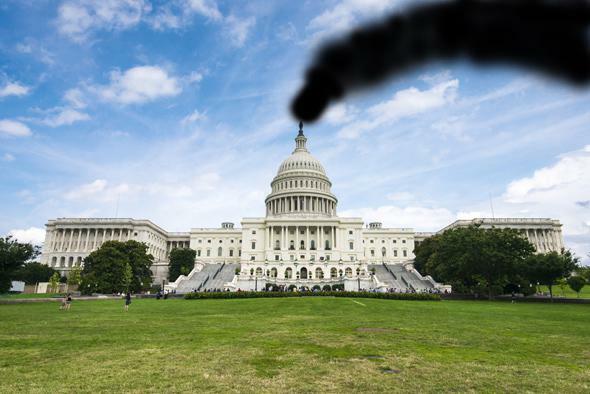 Climate denialism by Breitbart now gets the imprimatur of the federal government. This cannot stand. Act accordingly. P.S. If you want to contact the committee directly about this, its phone number is 202-225-6371. If you do, be brief, and be polite! If you have a representative on the committee, mention that as well. Correction, Dec. 2, 2016: I originally wrote that Don Beyer was a representative for Maryland. He’s from Virginia.